Local and federal investigators say someone tainted saltwater pools where recuperating sea lions swim at the Pacific Marine Mammal Center in Laguna Canyon last week and are seeking the public’s help to find the culprits. One of seven outdoor pools where staff of the Pacific Marine Mammal Center treat rescued animals, though not those injured by chlorine. This is the first known animal assault at the center or elsewhere in the region, according to federal agent David Reilly, of the National Oceanic and Atmospheric Administration in Long Beach, who is assisting with the investigation. A substance believed to be chlorine injured the animals, which suffered varying degrees of corneal ulcerations due to the contamination, according to animal rescue staff. All the animals had left the pool when the first member of the center’s staff arrived at 6 a.m. Tuesday, April 28, said police Sgt. Tim Kleiser. She noticed the pungent smell first and then saw all the sea lions uncharacteristically out of the water, he said. Police say a large amount of chlorine was mixed in the water filtration system in one of seven pools at the center, the county’s only marine mammal rescue center. Currently, 125 mostly malnourished sea lions are in the center’s care, Keith Matassa, the center’s executive director, said Tuesday. 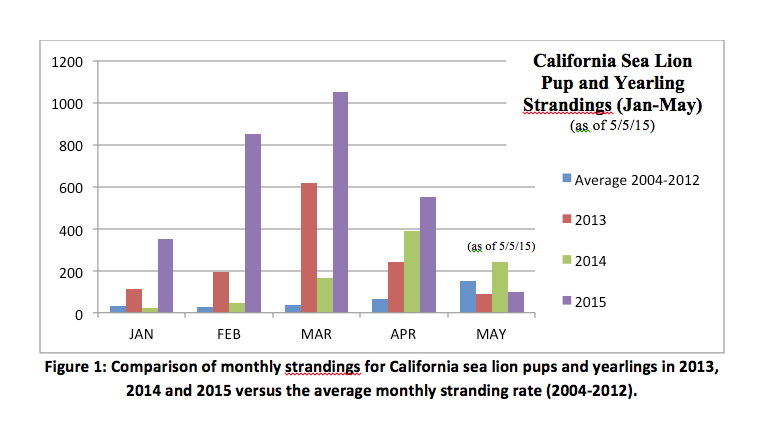 More than 2,900 California sea lion strandings have been reported so far this year, the highest level in 12 years, according to NOAA data. The chlorine contamination affected 17 rescued sea lions, which had been nursed back to health and were due to be released last week. Eight have recuperated but seven continue to receive treatment from a staff veterinarian, which involves flushing their eyes with fresh water, Matassa said. The sea lions’ eyes were swollen shut or clouded by the chemical, which Matassa said smelled like pool chemicals. Bacteria and algae is suppressed home pools used by people with chlorine concentrations of about 3 to 5 parts per million, and at a heavy use hotel pool at about 8 to 10 ppm, said Jared Benson, of Beachside Pool Service in Laguna Beach. The center maintains its pools at a far more dilute .5 ppm chlorine level for its rehabilitating sea mammals. Yet, chlorine levels were measured at 500 ppm in the contaminated pool, said Kleiser. “That would be extremely toxic,” said Dudley Wigdahl, curator of mammals and birds at the Aquarium of the Pacific in Long Beach, which keeps its chlorination levels at .3 ppm and monitors levels several times a day. “That would bleach their fur, it would burn their skin. I’ve never seen a reading that high,” he said. Kleiser said the center’s staff veterinarian determined that the animals’ exposure was actually less than expected, noting the absence of vomiting or diarrhea among the injured sea lions. “They were smart enough to get out,” he said. The attacker’s motivation puzzles police. Because whoever gained entry seems to know the area, disgruntled employees are one line of inquiry, Kleiser said. Investigators are also reviewing surveillance video, which takes in most of the center’s perimeter, he said. The assailants could face federal and state charges for violating the Federal Marine Mammal Protection Act and animal cruelty prohibitions, respectively. Police are eager to speak with anyone who observed anything unusual outside of the center Monday, April 27, between 8 p.m. and 6 a.m. Tuesday, April 28. They are urged to call Detectives David Gensemer or Abe Ocampo at 949 497-0377 or the NOAA hotline 800 853-1964. That angers and sickens me that someone would want to harm these beautiful animals. I would like to think maybe the filter system malfunctioned rather then someone doing something so cruel. I hope this individual and/or individual get caught and brought to justice. I would hate to think it was an inside job. My prayers with the sea lions that they will recover fully. there is a special place in Hell for anyone that could harm such beautiful animals. I hope you catch them and prosecute to the fullest extent of the law I wish good health to the injured seals and sea lions I love them!!! Felony animal abuse charges in addition to the charges re. The federal Marine Mammals act for the POS responsible for this cowardly cruel act. Hope video busts this creates.